The perfect collection for every aspiring young artist, musician or performer, THE YOUNG ARTISTS COLLECTION is a unique, new DVD set that will have them singing, drawing and learning all summer long! Beautifully packaged with vibrant art from the best-selling story Zin! Zin! Zin! A Violin, the 3-disc collection features animated adaptations from 17 award-winning and beloved books, narrated by celebrities such as Zach Braff, James Earl Jones, Mary Beth Hurt and a singing performance from Aretha Franklin. I was excited to discover the new Scholastic Storybook Treasures® DVD series title which features a wonderful collection of stories celebrating young musicians, young artists and young performers. I believe it is important to exposure my children to the arts at an early age and was surprised by how willing they were to sing and dance along with these fun stories. 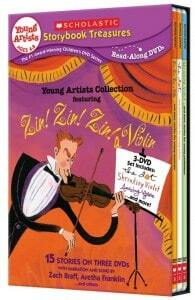 The Young Artists Collection features the musical story of Zin! Zin! Zin! A Violin, the art story, The Dot and the performance story, Shrinking Violets as well as our personal favorites such as Giraffes Can’t Dance, The Star-Spangled Banner and Norman the Doorman in addition to nine additional classics. If you have not yet had the pleasure of enjoying a Scholastic Storybook Treasures® with your child, this #1 award-winning children’s DVD series consistently brings the magic of the printed word to life with celebrity narration and songs. In my opinion it is a wonderful alternative to cartoons and introduces children to 15 stories that encourage self expression. My own children and I enjoy watching these titles together and I value how The Young Artists Collection promotes art appreciation through the use of their imagination and creativity. Scholastic Storybook Treasures® also promotes early reading skills with read-along DVDs. I have noticed an improvement in my six year old son’s reading abilities since he began watching this series and tries to read the text along with the narration. The Young Artists Collection offers almost 3 hours of entertainment for families and my own children and I really enjoyed this title. You can purchase the Young Artists Collection for only $24.99 by visiting the Scholastic Storybook Treasures® website.